The Angels Support Group has been busy putting up photos in a senior center conference room that doubles as a museum filled with artifacts chronicling the center’s history. The small room is now also home to a new memorial the group hopes will help preserve the legacy of giving by volunteers who have passed away. Most of the old-timers who started the park’s programs are gone now, says Chris Mojica, a long time volunteer at Ruben Salazar Park in unincorporated East Los Angeles. If it were up to him, everyone who uses the center would know the names of the people whose hard work, sacrifice and love helped make Salazar Park a vibrant community center. Located in the heart of East L.A on Whittier Boulevard, Salazar Park is a place where people can come together and share good times, learn new skills, and even work on ways to influence elected officials by registering voters and sending letters on issues they deem important, the 86-year-old Mojica told EGP. “It seems like just yesterday our park was called Laguna Park,” recalled Angel Support Group members in an email to EGP. They said most of the people who use the park aren’t aware it was at the center of one of the most important events in the fight for civil rights by Latinos in East Los Angeles, the Chicano Moratorium. Nor do they know its name was changed to honor Ruben Salazar, the journalist killed by Sherriff deputies during the Chicano Moratorium in 1970. But the park’s legacy is not just about that moment in history, emphasizes Mojica, it’s really about the people who took it upon themselves to make sure services and activities are available to young and old in the Eastside, whether he or she was born in the U.S. or is an immigrant, speaks English, Spanish, or both. If you live in a working class community and don’t have very much money, there aren’t always as many resources available, and those there are aren’t always the best. That’s why Salazar Park is so important to this community, said Ray Guerrero, 71, who has been lobbying the county parks department to include a variety of new amenities when it remodels the recreation center later this year. It’s due to the generosity of a long list of volunteers that “we have dancing, Pop Warner football and all kinds of sports,” ESL classes and other activities, the group said. The Angels Support Groups is under the umbrella of the Friends of Salazar Park, a decades old volunteer organization dedicated to making the County of Los Angeles-run recreational facility a place where families feel comfortable gathering, and seniors feel wanted and respected. The Angels group was formed about a year and a half ago to provide emotional support and comfort to seniors as they face the challenges of growing old. Call it nostalgia or just wanting not to be forgotten, but these days there’s a sense of urgency in their efforts to memorialize their time and work at Salazar Park. “We’ve lost some of the best friends Salazar Park ever had over the last few years and we just want people to know their names,” Mojica said, sharing with EGP a list of some of those who were around for decades giving of their time, energy and whatever resources they could muster before they passed. 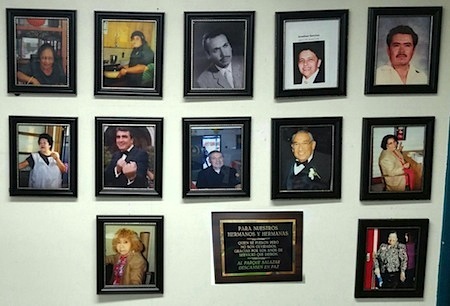 Many on the list are honored with a photo on of the walls of the senior center. 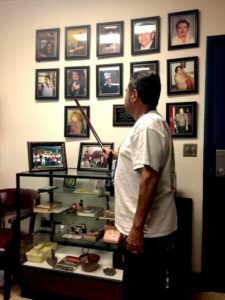 On Tuesday, Guerrero used his cane as a pointer, as one by one they named the volunteers whose photos have made it on to the memorial wall. Ortiz joked that volunteer music instructor Marcelo Vasquez has left room for more photos, but she doesn’t want her picture up there anytime soon. There’s Gabriela Salazar, or Gaby as most people knew her, a spitfire of a woman who volunteered at the center five days a week for over 30 years, teaching Zumba, organizing field trips, serving Thanksgiving dinner and giving out toys to the area’s many low-income families. Big in heart and full of energy, Gaby was always there. Richard Romero, Audry Torres, Sergio Murga, Rosa Portillo and Elena Camargo all gave of their time and will be missed, so will former park director Dora Montijo. Jonathan Sanchez, EGP’s COO and associate publisher who passed away in late December, has also earned a place on the wall at Salazar Park. “He gave us so many beautiful stories and donated money to our senior center,” the group said. “All these wonderful people who gave so much, not only to our senior center but Salazar Park, have left us, but they are not forgotten,” the group said. We owe them a lot, said Ortiz, who says she plans to follow their good example. “What they gave came from the goodness in their souls,” added Vasquez. August 2, 2017 Copyright © 2012 Eastern Group Publications, Inc.